Originally published in 1893 and never out of print, Emile Durkheim's groundbreaking work remains one of the cornerstone texts of the sociological canon--now updated and re-translated in this new edition.As the Industrial Revolution was changing the landscape of society, Durkheim presented a new vision of the social structures at the root of capitalism, and the issues he grappled with still resound today. If pre-industrial societies were held together by common values, sentiments, and norms, equally shared by all, what holds modern societies, with their complex division of labor and non-cohesive social structure, together? What did this new social order mean for the autonomy of the individual? Durkheim argued that class conflict is not inherent in a capitalist society, as Marx contended, but that the unfettered growth of state power would lead to the extinction of individuality. Only in a free society that promotes voluntary bonds between its members, Durkheim suggested, can individuality prosper. In this new edition, the first since 1984, world-renowned Durkheim scholar Steven Lukes revisits and revises the original translation to enhance clarity, accuracy, and fluency for the contemporary reader. Lukes also highlights Durkheim's arguments by putting them into historical context with a timeline of important information. 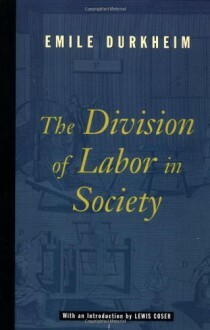 For students and scholars, this edition of "The Division of Labor" is essential reading and key to understanding the relevance of Durkheim's ideas today.